"IB#3: Operating Instructions — Fandrich Branch Collector" is available in PDF format. To view it, please click here. The Fandrich Branch Collector is a simple device for collecting evergreen cones for seeds. 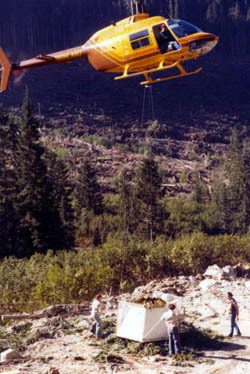 With the collector suspended under the helicopter, the pilot moves the helicopter down, over, and up the selected tree to catch and collect the cone-bearing branches. Only the pilot is involved in the collecting of the cones. 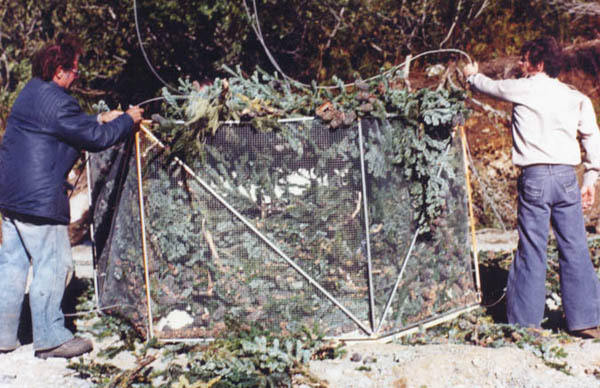 When the wire basket containing the cut branches is full, the pilot lowers the collector over a dumping site so that the cables hanging under the helicopter can be attached to the wire basket. 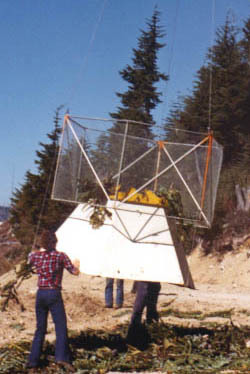 The pilot then lifts the basket to quickly dump the load of cone bearing branches. 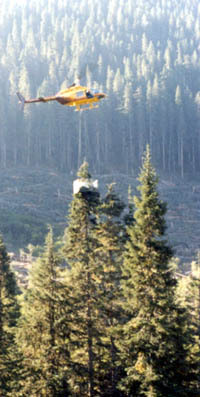 To collect the cone-laden branches, the pilot lowers the branch collector over the top of the cone- laden three. 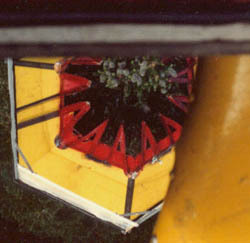 By moving the collector horizontally so the tree trunk enters a cutting slot, the pilot can cut most of the top branches in one lift. The cut branches fall into the basket surrounding the cutting head, and the pilot makes another cut or flies to another tree. 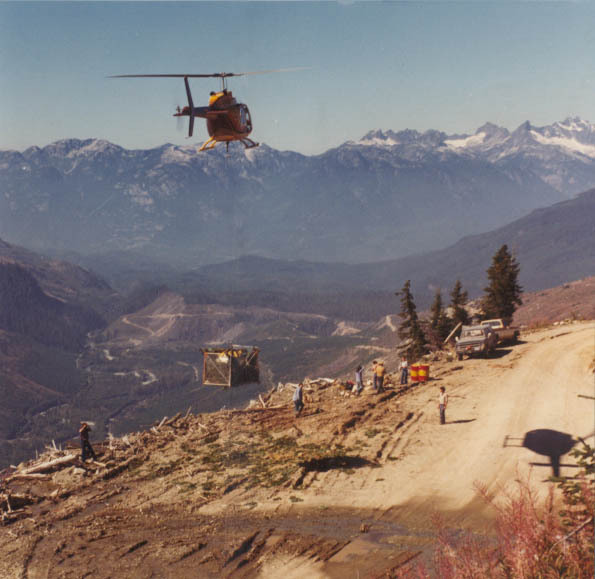 To dump the cone-laden branches the pilot lowers the collector at the dumping site to permit the ground crew to hook the wire basket to the cables hanging from the helicopter. up again to collect another load. 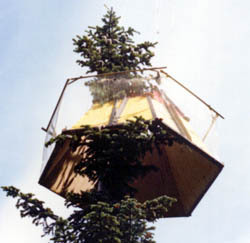 Suspended under a helicopter, the Fandrich Branch Collector mechanically collects cones from the tree tops where the healthiest space cones grow. The seeds coming from these healthier cones have a higher germination rate space (95 percent is common) while the parent tree continues to grow. 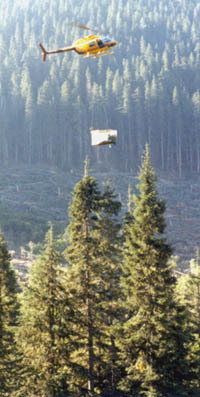 Cones from previously inaccessible trees can be quickly and efficiently delivered to a dumping site which is readily accessible by truck. Says the amount of manual work required to collect the cone-laden branches is minimal, the Fandrich Branch Collector can rapidly and safely collect large volumes of prime cones from preferred areas. Because the branch collector has no moving parts it requires no maintenance other than the occasional sharpening of the cutting knives. deliver them rapidly to a chosen dumping site.